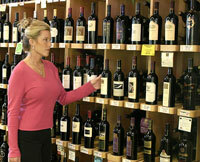 This is an open invitation to readers of organicwinefind.com to share your experience of shopping for organic wine. We’d like to get a pulse on what happens when you shop for organic wine in an average wine shop around the world. Do they have an organic wine section? How many organic wines are in it? What’s the selection like? What happens when you tell a salesperson you’re shopping for organic wine and ask for their help? Can the sales person answer questions about the different types of organic wine, sulphur etc? What happens when you ask “do you have any other wines made organically that aren’t in the organic section?” Can you spot any using the organicwinefind.com search tool? Please post your story in the comments section, we’d love to hear it.